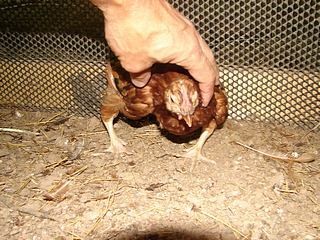 When raising chickens, just like with having any animal, we eventually will face chicken diseases with these birds of some sort. There are many chicken diseases that can effect your flock. We can prevent some, but some may be connected to genetics or exposures prior to your owning them. Purchasing vaccinated stock can possibly help you avoid troubles. Although vaccinating may destroy the organic value of home raised chickens for food. Good animal husbandry, providing the best possible food, water, and environment is the best prevention for much disease. Over crowding chickens in unnatural and stressful conditions is a breeding ground for disease, which is why some farmed chickens live their whole lives with a certain amount of antibiotic in their systems. How do my chickens get sick? What are some of the main causes for illness? How can I prevent as many of these diseases as possible? How can I identify what is wrong with a chicken? Take egg drop syndrome for example it is a problem that has occurred over much of the world, but the more we learn about this problem the better we are at managing it. Today there are many vaccines that can be very helpful and good preventative maintenance practice. When you start thinking about chicken health you must ask yourself why you want to raise chickens? Many people have started raising their own birds today because they want to assure that they are getting quality fresh eggs and meat for their family. If this is the case, you need to be an expert on prevention of chicken diseases. Why would you want to raise healthy birds to eat and then fill them with medications and chemicals that you are trying to avoid when you buy chickens from large processing plants? You don't necessarily have to fill your birds full of drugs to prevent chicken diseases. You've heard the old saying, "you are what we eat." This isn't just the case for humans. Diet and nutrition has a lot to do with your chickens as well. Some people these days just buy whatever looks good to them in the supermarket, not caring what man-made products have went into their food, while others are very cautious about what they eat and search for the most natural, fresh, and organic foods they can find. Some chicken diseases can be prevented by focusing on health. So what about your chickens? If they are locked up in a confined area without access to the natural things chickens want to eat, living on top of feces, having little fresh air and sunlight, you’ve just recreated a commercial chicken farm on a small scale. chicken feed that will keep them healthy and at the maximum you will want to make sure that they are eating organically and naturally. Just like with what you eat, all of us are individuals and make our own choices. The choice is yours since your chickens are totally dependent on you for all their needs. To understand chicken diseases, you’ll want to understand a great deal about the chicken and how it should live. You don't need to be a biologist, but a basic understanding of the anatomy of a chicken will help as well as knowing the history of our modern day domesticated chickens. The sizes and colors and shapes of chickens have changed since they were domesticated nearly 8000 years ago, but their basic needs haven’t. Once healthy immune systems can no longer protect them from environmental changes and seasonal challenges. When you understand how a chicken is put together you can better understand how to avoid many of the chicken diseases out there. One of the most annoying risks that our chickens face are the dreaded parasites. These annoying bugs can come in many different forms, both external and internal. Learning more about them and how to prevent them from annoying and damaging your flock is very important. Unless you are a poultry veterinarian, you probably don't know every bird disease out there. Heck, most vets probably don't know chickens, unless they specialize in birds. We can take a quick tour of the common ailments that can affect your flock. From air-sac disease to ulcerative enteritis, we try to give you a quick reference guide. Questions Other People Have Asked. Click below to see recently answered questions. COULD RAT POISON CAUSE THESE SYMPTOMS? WHY WOULD 8-10 YEAR CHICKEN BE UNWELL? WHAT'S WRONG WITH MY HEN? My hen is not feeling good and she vomitted up some yellowish liquid when I picked her up. WHAT SHOULD I DO FOR MY SICK CHICKEN? Pullet Sick for a Month, Should I Put Her Down? What to do for a sick chick? Hen's beak has brown raised spots and area around comb has the same. Her head is looking grey now. My Golden Wyandotte has a large bump on her ear. What is it? It just started yesterday and is even larger today. She seems to feel fine. Why are my chicken's eyes suddenly swollen? The comb also looks cracked, dry and swollen. My 10 week old Golden Commet has a large tumor in the breast area or possibly the breast muscle detached from the breast bone. Why has my hen lost her appetite?